PET FRIENDLY HUGE HOT TUB & JACUZZI KING BED AMAZING VIEWS! 3 MIN 2 GATLINBURG! Please Visit both of our $108.00 Spectacular Vista Cabins here at Private Homes, Stoplight #1 in Gatlinburg to check for Special Discounts, Availability and our many 5-Star Reviews. Spectacular Vista (#570145), Incredible Vista (#576527), and our lodge that sleeps up to 18, Spectacular Vista Lodge (#576529). Spectacular Vista All Log Cabin 570145 is located in the middle of 100 acres of virgin forest and offers Incredible Views of the Great Smoky Mountains including stunning views of two of the three highest peaks in Tennessee; Clingman's Dome, and Mt. LeConte, but is, almost unbelievably, located only 3 minutes from traffic light #1 in downtown Gatlinburg and 9 minutes from traffic light #10 in Pigeon Forge. Spectacular Vista Cabin The Cabin has a 100% Private Deck with a large, 5 person hot tub. This is a two-story true log cabin with six-inch logs throughout. The spacious, private deck offers a large Hot Tub with Incredible 180 degree Views of the Great Smoky Mountains. The Living Room features a Stone Wood, a new leather sleeper-sofa and a 55 inch LED Flatscreen HDTV with over 200 Channels and Bluray DVD. You can prepare Romantic Candlelight Dinners in your Fully Furnished Kitchen with steaks grilled on the Park Grill a few feet away. The Kitchen appliances include a Stovetop Oven, Refrigerator, Dishwasher, Microwave, Coffee Maker, Toaster, Blender and Waffle Iron. The Kitchen is fully furnished with Utensils and Cookware. The expansive second-floor features an Open Loft Bedroom with a Full King-Sized Bed under a Vaulted Cathedral Ceiling. Wake to the incredible Views of the Smokies through your Four Cathedral Windows. After dinner, enjoy a game on the full-sized pool table or choose a show from the Flat Screen TV with over 200 Satellite Channels. The Cozy Living Room features a Romantic, Stone Wood burning Fireplace with Free Firewood Provided. If you’re looking for a true Honeymoon Log Cabin in Gatlinburg with Panoramic Mountain Views, you’ll love Spectacular Vista. Spectacular Vista is located just 1.1 miles from Traffic Light #1 in downtown Gatlinburg. Spectacular Vista has easy access to Gatlinburg's Fine Dining and Amusements including Ripley's Aquarium and the Space Needle which this cabin looks DOWN on. Or, you can take the short, scenic drive along the beautiful Little Pigeon River to the Live Music Theaters, Wholesale Factory Outlets, and Amusements of Pigeon Forge including Dollywood and Splash Country. And don’t forget, you are within 4 miles of two entrances of The Great Smoky Mountains National Park with its Hiking, Horseback Riding, Rafting, and Historical Tours including the Roaring Fork Nature Trail and Cades Cove. Go to traffic light #1 in Gatlinburg. Turn (the only way you can turn). Go ¾ of a mile to Kristis Place on the left. (If you see some apartments, you have gone too far.) Turn left and go .3 miles. Spectacular Vista is the first cabin on the right. Check-in: There is a lockbox next to the door. The key to the cabin is inside the lockbox. Open the lockbox, take out the key, and go in. Check-in is that simple. Please text several hours before your arrival with your cabin name for the most recent lockbox code and cleaning schedule. We are flexible on check-in and check-out times. Usually check-in is at 4pm but you can come in as soon as it is cleaned. Usually check-out is at 10am but we can often arrange a later time. Pet Fee: Pets are welcome. Please add $48 to the total for the pet fee. WIFI: We have Verizon Jetpacks for WIFI which can handle up to 10 devices at one time. We ask that you not download movies or videos though as each movie costs us approximately $30 once we go over our monthly limit. To get the password on the WIFI, press the start button three times and the passcode will be displayed on the WIFI box. Cancellation Policy: If you have to cancel, please give us as much notice as possible. We will return all of the deposit for all of the nights that we can rebook. Reservations: To make a reservation, please send a request via email to the manager requesting the specific cabin and dates and wait for a responding email confirming the reservation. SENDING THE DEPOSIT DOES NOT MAKE THE RESERVATION. We make the reservation for the party who EMAILS us first requesting the reservation, not the one which sends the deposit first. Thank you. Deposit: If you make a reservation, we ask people to send 50% of the total (or more if you wish) as a deposit. Plan your Spectacular Vista All Log Cabin getaway today. We have completed a Revolutionary, 4-part business plan. Originally, we built these cabins 25 years ago and rented them for $99.00 a night. We quickly developed a loyal clientele who returned year-after-year and sometimes several times a year. We were packed. We then changed to a management company which raised the prices and added extra fees and we lost our loyal clientele from the '90s. Now, here's our Revolutionary, 4-Part Business Plan. First, we created a product that is much better than it was in the '90s. We completely restored the cabins to a condition even better than when they were new. Also, we reengineered the road to meet the highest city standards. Finally, we installed WIFI and 2-LED HDTVs in each cabin, one 50' in size. Second, we removed the trees in front and beside the cabins to create, arguably, the best 180 degree view of the Great Smoky Mountains anywhere. Third, we decided not to require that the guests put the typical $100.00-$500.00 security deposit, purchase $39.00 insurance policy, or even a submit a credit card number! Everything's on the honor system! That's why the final bill is so low. The honor system is working. Not one item has been stolen or broken! Finally, we made the most Revolutionary move. We fired our management company, listed our cabins with VRBO and slashed prices LOWER than in the '90s! Most nights are offered at $98.00! As a result, we have booked over 1,000 nights in the past 3 months and received over 80 5-Star Reviews! We are developing a new, loyal clientele that is already rebooking for next year. This allows us to spend less time marketing and more time continuing to improve the property to the highest standards possible. Our corporate mission is the same as the Apple and Disney Corporations: to offer a great product at a great price and make people happy. Our 40+ 5 Star Reviews and repeat clientele show that its working. Please join our family of friends who vacation with us over and over. The Great Smoky Mountains are our great love and passion. We believe you will fall in love with them too. The greatest compliment we have received on the property has come from about a dozen guests over the past three years who have asked, 'Is this a part of the National Park?' The boundary between our Property and the National Park is almost indistinguishable. The photos are real and untouched. Our forest appears to be contiguous with the National Park. We truly have one of the best views and one of the best locations in America. Spectacular Vista is only 39 miles from Harrah's Casino in the Cherokee Reservation in North Carolina. Spectacular Vista has become an Affordable, Secret Hideaway for Honeymooners. Spectacular Vista offers one of the best views in Tennessee. Fully Stocked Kitchen with Oven, Microwave, Coffee Maker, Toaster, Blender, Waffle Iron and Dishwasher. 50 inch Flat Screen TV located in the main room. 32 inch TV located in the bedroom. Year-Round access to the Gatlinburg Community Center at 156 Proffitt Rd with Indoor, Olympic-Sized Swimming Pool, Bowling, Gym, Ping Pong, Fitness Room & Racketball Courts. Nominal Fee for Activities. Spacious, 5 Person Hot tub with Incredible Views from our Private Deck & Romantic Heart-Shaped Jacuzzi in the bedroom. The cabin is perfect for a couples getaway. The view from the deck is amazing and it’s close enough to town to have a quick drive home after a night out or dinner. The owners are extremely friendly and responsive and we will definitely be staying in one of their cabins again. The cabin location and views are excellent. We saw double rainbows twice after brief showers, beautiful views! The cabin interior needs updated and a good thorough cleaning. The mattress and box spring set on the bed in the loft is very much worn out. Pretty disappointed that we couldn’t use the hot tub on our last morning (water level went down overnight). Can’t say that we would book again. Ed and Val are nice folks and were quick to respond when contacted. The view from Spectacular Vista Cabin is amazing. 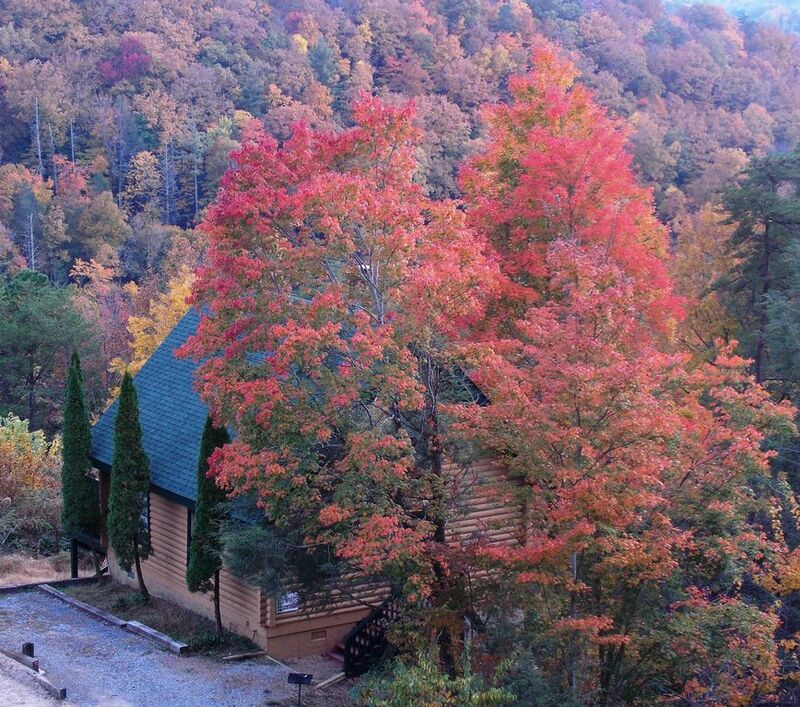 The cabin is in the perfect location, close to Gatlinburg and Pigeon Forge. The cabin was very clean, I could smell the air freshener as soon as I walked in the door. It was very nice.r The owners, Ed and Val, replaced the couch/sleeper sofa in the cabin and it is very comfortable. Ed and Val responded to my messages immediately. We will definitely book this cabin again. Great little cabin that has everything you could need and still maintains rustic charm! Wish we could have stayed longer! Owner is very responsive and great to work with! Ed's place is a nice place to stay. The pictures and reveiws paint a good idea of what the place is like. You are super close to Gatlinburg. There is a super market is close by. The front porch was perfect. There is plenty of seating out on the porch. The picnic table was fixed, great rocking chairs, folding chairs, and a wonder swing round out a relaxing way to enjoy the spectacular mountain views. We thought there should be more comfortable inside seating. I was told that the owners have a new sofa coming which was really needed. The reason we could not give the cabin 5 stars was that there really needs to be one more comfortable chair in the living room. Having only a sofa to watch TV on a cold or rainy day was not enough comfortable seat. We would have enjoyed more comfortable seating inside, but others might like the pool table more. My Wife thought the bed was fine, It wasn't as comfortable as I would have liked. We thought the place was clean and all the electronic worked. A little more updating will continued I am sure. We are very use to cabin life and we enjoyed the place. We could drive in any direction for great places to visit. We really enjoyed a the a 45 mins drive to Cades Cove. Ed and his wife got back to us right away when we contacted them.